Hungarian rabbi and writer; born May 19, 1867, at Kecskemet. He studied at the rabbinical seminary and the University of Budapest, and at the Jewish Theological Seminary and the University of Breslau, 1888-89 (Ph.D. 1890, Budapest). Receiving his diploma as rabbi from the seminary of Budapest in 1892, he officiated as rabbi at Somogy-Csurgo from that year to 1895, holding at the same time the chair of Hungarian and German literatures at the Evangelical Reform Gymnasium of that city. In 1895 he was called to the rabbinate of Lugos, and in the following year to that of Ujpest near Budapest. 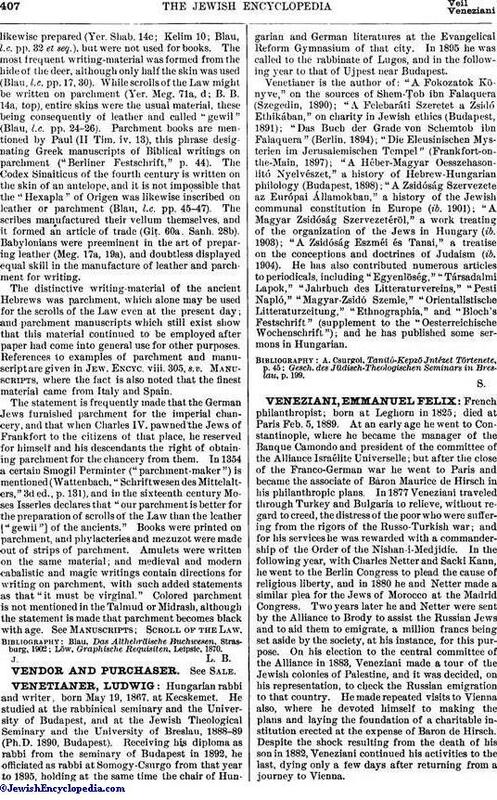 Venetianer is the author of: "A Fokozatok Könyve," on the sources of Shem-Ṭob ibn Falaquera (Szegedin, 1890); "A Felebaráti Szeretet a Zsidó Ethikában," on charity in Jewish ethics (Budapest, 1891); "Das Buch der Grade von Schemtob ibn Falaquera" (Berlin, 1894); "Die Eleusinischen Mysterien im Jerusalemischen Tempel" (Frankfort-on-the-Main, 1897); "A Héber-Magyar Oesszehasonlitó Nyelvészet," a history of Hebrew-Hungarian philology (Budapest, 1898); "A Zsidóság Szervezete az Európai Államokban," a history of the Jewish communal constitution in Europe (ib. 1901); "A Magyar Zsidóság Szervezetéröl," a work treating of the organization of the Jews in Hungary (ib. 1903); "A Zsidóság Eszméi és Tanai," a treatise on the conceptions and doctrines of Judaism (ib. 1904). He has also contributed numerous articles to periodicals, including "Egyenlöség," "Társadalmi Lapok," "Jahrbuch des Litteraturvereins," "Pesti Napló," "Magyar-Zsidó Szemle," "Orientalistische Litteraturzeitung," "Ethnographia," and "Bloch's Festschrift" (supplement to the "Oesterreichische Wochenschrift"); and he has published some sermons in Hungarian. Gesch. des Jüdisch-Theologischen Seminars in Breslau, p. 199.